This tutorial will show you step by step how to burn an MP3 CD with Nero Burning Rom. You can make and burn an MP3 CD with MP3 music files and folders. If you want to make and burn an MP3 CD with folders, then it's a good idea to create folders on your computer and copy the MP3 files in these folders before you continue. If I were you, I would use a CD-R instead of a CD-RW (rewritable), because not all CD players can play rewritable CDs properly. 1. Insert a blank (empty) CD into the CD burner drive of your computer. If the New Compilation window does not appear, then click on File located at the top left and choose New from the drop-down menu. 3. Select CD at the top left of the New Compilation window. 4. 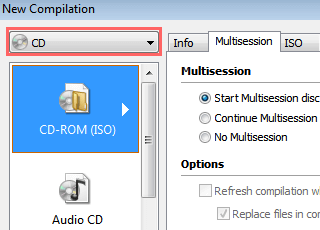 Click on CD-ROM (ISO) to select this option. 5. Click on the New button located at the bottom of the New Compilation window. 6. 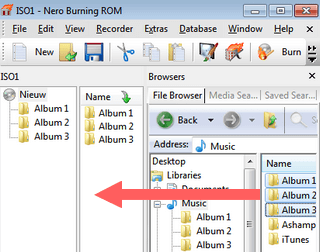 Go in the right section of Nero Burning Rom to the location on your computer where the songs or folders are stored you want to burn to a CD. 7. Drag and drop the songs or folders from the right section to the left section. Tip: At the bottom of Nero Burning Rom you can view how much MB in file size you have left on your disc (how much music you still can add to your disc). 8. When you're done adding files or folders to the compilation, you click on Burn located at the top. Or click on Recorder in the top menu and choose Burn Compilation from the drop-down menu. A Burn Compilation window will appear. 9. If you want you can select and change a few settings. 10. When you're ready, you click on the Burn button located at the bottom of the Burn Compilation window. Nero Burning Rom will start burning your MP3 CD.